I thought it was about time I started a little journal of our adventure Here are the 2 girls (hopefully this picture works). My bonding tent was delivered yesterday. Lets say its bigger than I anticipated. This is a photo with it on top of my queen bed lol. I can't wait to get them in there! Your girls are stunning! No worries, building trust can take time. The tent, let me try to explain this correctly. Please let me know if I'm not describing clearly, lol. Try to take the sides that over-hang, or are too close to the edges and fold them over the floor slightly away from the edge enough that they don't fall off sides. If it's a pop-up tent, this should be fairly easy. If you need to, try close pins or some plastic clamps/clips to hold in place. As for the ladder in the cage, I was once advised to not use them. 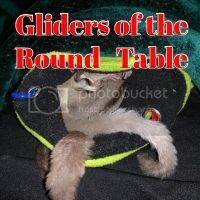 I was told that they could cause injury to the glider if they land on one and it gets dislodged or something like that. I removed mine immediately, they don't need ladders anyway. The shelves are fine, I've always liked having one or even two in my glider cage. Welcome to the madness!!! Now it begins...... Bwahahahaa! Its funny you mention that about the ladders. I have since taken them out because the grey one flew off the wheel and got all tangled in it about a day after that photo and went crashing down, so they all came out after that. Not to mention they are pretty noisy. And good idea about the tent, I will give that a shot tonight. I have some extra clothes pins laying around (I use them as chip clips lol). I still don't have names for them...Its sooooo hard lol. Last edited by Hydrus; 04/06/18 07:29 PM. Good news this morning The Grey one actually came to me to get her yogurt drop! I just held it through the bars before I was on my way out for work and she came up and grabbed it and sat by me and ate it. I didn't try to open the door or anything. I was super excited. The White one on the other hand... she was crabbing right away from inside her pouch (I'm not even sure how she knew I was there...I was super quiet). So when she started crabbing I held a yogurt drop again through the bars over her pouch. She came flying up, I think she intended on biting me but got a mouth full of yogurt drop instead and was content to pull that back in her pouch and eat it. I chalk that up to a win lol. No blood drawn is a +1 in my book. Its such an emotional roller coaster. One day I'll feel the worse, nearly in tears, because I feel like I'm doing all I can to help them love me (even if that means leaving them alone) and it seems to do no good. But then it's these days that I'm soaring above the clouds with happiness at one of them taking a yogurt drop. lol. Now...I just need to sort out their names. I'm trying to think of something unique, perhaps something a bit nerdy. My other animals I've named from Stargate SG1 and Stargate Atlantis..I also love Star Trek, Star Wars, obviously the Stargate's, anything Marvel, love playing World of Warcraft, pretty much anything fantasy and scifi - I know, probably weird for someone that is 37 lol. I have named my saltwater fish too but I won't list them all here lol. Celebrate every victory and every forward progress. Be prepared for the setbacks too, but try not to take them to heart. The white one reminds me of how my Lulu was. She'll come around, just hold on to the basic protocol. Good luck with tent time! I am glad they are warming up to you. I have had mine a week and have started bathtub/bathroom time. They are really bonding with me, and it is really exciting! I have one that does that during bathroom time. I bribe her to go back in the pouch, and when she is eating her treat, and they are both in the pouch, I just close it up and take them back to the cage. Once, they went back into the pouch on their own. I think they were still a little sleepy as it was early afternoon. So far so good! Today was the first day we did tent time and it was awesome! It took them about 10 mins to come out of the pouch. The grey one was first and about 15 mins after that the white one came out. They crawled all over the tent and even jumped on me quite a few times. NO bites either I didn't grab for them or try to pet...I just let them do their own thing at their own pace and it's working out really well. I did a lot of bribing with honey and yoggie drops to make sure it was a very positive encounter. I waited and they eventually got tired and went into the pouch. So I took that as a sign we were done for the evening. I'm so thrilled. We had such a rough first 3 weeks but I took everyone's advice and backed off and went at their own pace. I'm so glad I did. My cousin even knows the rules. His kid wanted to touch them and he told them no because I'm working on building trust with them and can't risk anything breaking that. Hahaha apparently I've talked about the bonding process a bit more then I remember. Congrats on a great tent time! Great news!!!! Thanks for the update! Last edited by Hydrus; 05/15/18 11:11 PM. Congrats on the progress! Cute babies! They are so cute!!!! And yes, baby steps definitely help! Congrats! Ariel came to mind. They look like princesses. Very good progress indeed and very cute little ones. Thank you so much for the update and pictures. Ooo, ooo, we're doing name suggestions?! So I'm not familiar with the new sci-fi. Watching the news, Megan and Kate are popular. How about Athena and Clio, both daughters of Zuess. I'm getting a little boy in 6 days. And can't wait to meet him. Feather says I have to name him. Here is my predicament. Dot and Fiona know their names. I want the boy to have a name that doesn't sound like their names. I'm thinking Bo, or Beau.